Phase 2: Context & Requirements Analysis. Phase 3: Development & Evaluation. Phase 4: Assessment & Completion. WP4 is responsible for defining the PICOS architecture that will be developed further through to implementation in successive work packages, principally WP5 and WP6. Deliverable D4.1 is the first deliverable produced by WP4. Its role is to draw together the work of previous deliverables, for example requirements gathering, and derive a technical description of the components that will make up a PICOS community. In so doing, D4.1 answers several important question that define the problem that the PICOS project aims to solve, and scopes the solution. Earlier deliverables reports on the requirements of our reference communities, and strongly influences the architecture. By taking the original requirements, identifying features and deriving components, the PICOS architecture reflects the needs of the target community(ies) that we seek to address. The D4.1 development process is outlined below. PICOS is interested in all communities, but especially mobile communities. In one of tzhe first steps if D4.1 we sketch out typical topologies in order to understand the physical relationship between the various entities that make up a community. Our aim is to be as topology agnostic as is practicable. Besides this, we focus on another important aspect of a community, namely Trust. Every community will have a different trust model. Some will be very trusting, while other will be distrusting. It is important to align the architecture with a trust model that best matches the type of community that PICOS is planning to address. Ideally, PICOS will support multiple trust models, and it is our aim in designing the architecture to include a wide range of models, but we recognise that in the short-term we need to be pragmatic if the following work packages are to be successful in the limited time that we have available in the project. For the outset we understood that legislation would play an important role in defining the architecture. Compliance with privacy and law enforcement laws is mandatory, but this requirement also creates tensions in terms of trust. The PICOS architecture needs to balance these often opposing needs. In D4.1 a dedicated section explains the legislative requirements placed on PICOS. Based upon these preliminary tasks, we start to define the architecture. We begin with a set of PICOS Principles, derived from past work in PICOS and existing published research, which establish the main features of the architecture. In parallel with the PICOS Principles we examine the main features that PICOS will deliver, starting with user expectations which we subsequently use to derive system features. With the Principles and key features defined, we start to create the architecture. First we define and describe low-level components, ready to form the architecture. We test our understanding of the architecture by creating a set of carefully selected use cases, which we believe describe how several of the key features of the community will be handled by the architecture. The set of use cases that we chose to examine is only a sub-set of all the possible uses that the architecture may encounter, but we believe they represent the core essential use cases. D4.1 describes the PICOS architecture at a high level, and does not include any implementation details. However, in defining the architecture it was inevitable that some implementation considerations would arise and consequently influence the design. Rather than ignore this fact, D4.1 also includes the description of a practical implementation of the architecture. The description is high-level, but it gives clues as to how communications, community, trust, privacy and identity management services can be achieved. Finally, the deliverable describes the links to the follow-on work packages that will develop the architecture further, namely WP5 and WP6. These two work packages ultimately produce a prototype that can be evaluated in user trials. One role of D4.1 is to provide direction and justification for the decisions that WP5 and WP6 will need to take. 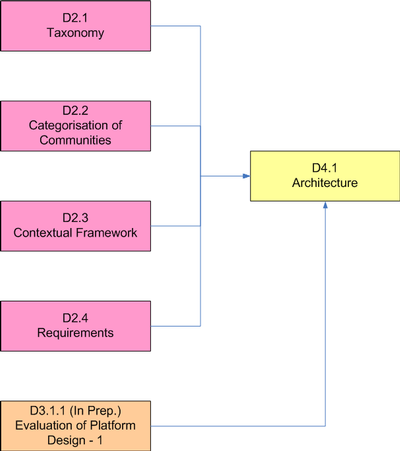 The Second Architecture deliverable (D4.2) describes a refined version of the architecture for online communities, focusing on those communities with an emphasis on mobility and mobile users. The PICOS architecture is distinguished in that it draws on a set of reference communities for inspiration and guidance, and in the later stages of the project for validation. The consequence of this is that the PICOS architecture is firmly grounded in the needs of today‘s online communities, recognising their value, the tensions and dilemmas – particularly around trust, privacy identity management and general security – that their users encounter every day. The approach taken has been to continually cross-reference the requirements of the reference communities‘ with design decisions, taking care when abstracting ideas not to lose sight of the driving motivations. In fact, clearly demonstrating ‗provenance‘ is a theme that runs through all PICOS deliverables (the extent of this cross-referencing is illustrated in Appendix H, Table 11 and 12). The reference communities are not the only factors influencing the architecture. Legislation needs to be complied and assurance – the ability and proof that the architecture delivers on its promise – must be demonstrated. For these reasons, legal, assurance, prototyping and trialling, are key threads that run in parallel to architecture design, and have had a strong influence. In developing the architecture, we have addressed several open questions, for example how to balance anonymity and accountability in a pragmatic and practical way. This has led to innovative solutions that the PICOS architecture captures, for example partial identities, the privacy advisor, and trust through reputation and openness. Of course, there are open research questions that to some extent remain unanswered, for example around reputation management, which we hope can be explored by future projects. We believe that the needs of online communities are changing, with heightened awareness by users of the consequences of poor privacy and misplaced trust. Operators and developers of online community platforms and services are aware of changing attitudes, from the current open ‗social networking‘ to controlled and considered sharing of personal information between groups of trusting individuals. The PICOS architecture is well placed to address this emerging gap in expectations between user and provider. The ‗cost‘ of security is often seen as an inhibitor to change, either because there is a direct financial cost that is difficult to accommodate, or because a successful business model is disrupted in some way by the changes. PICOS is conscious of this fact, and has strived to design an architecture that satisfies both requirements. Advertising is seen as a successful means to fund online communities, but the motivation of advertisers is often considered to be at odds with the privacy needs of users, especially when advertisers turn to marketing techniques directed at specific individuals. The PICOS architecture in intended to address the needs of users, community providers and third-party organisations in a way that provides a positive benefit for all. Please see the respective Deliverables for full details. components that were most relevant for the PICOS use cases. For each of those components, the document describes how the component has been implemented. In some cases, the components have been implemented as functions of the PICOS platform prototype; in other cases, the components have been implemented as a combination of client-side application functionality (WP6) and server-side platform functionality (WP5). trust aspects) and to access community services. Please see the respective Deliverable for full details. The task is split into two cycles and comprises the prototypical development of a Community Application in each cycle, based on the previously developed PICOS Platform. The according D6.1 deliverable addresses the angling community application prototype version 1, which is the initial version providing the client technological realization of PICOS functionalities for a leisure community. Within this prototype, special attention was paid to the integration of basic features of privacy-enhancing identity management into a comprehensive trust-enabling, privacy-respecting community prototype, relying on the foundations of the first PICOS Platform prototype. During the realisation of the application prototype, requirements on the PICOS Platform were refined, particularly with regard to the support for privacy enhancement based on PICOS technologies. The community application prototype 1, the Angler Community Protoytpe, provides to end-users a collaborative environment that allows to fully control and to minimise the collection of personal data on services side. Furthermore, users can keep track of rules established on their data (including profiles, location and presence) by which maximal transparency is realised. Being a collaborative environment, we have aimed at giving the user as much freedom as possible while selecting the most privacy-preserving default options. Beyond, the introduction of advanced privacy and trust mechanisms supporting core conceptual PICOS research, which have not been sufficiently tested before with a community comprising real users, provide us with an exceptional opportunity to validate and orient our work for the second and final phase of the project. By this approach, reasonable collaborative community interactions as well as the protection of privacy become possible. For further details please see the respective Deliverable. The developed community application is subject of the PICOS user trials. The 2nd cycle of the Community Application Prototype development started in the beginning of 2010. The first PICOS community trials started in November 2009. In this part of the project we test the Community Application Prototype with the anglers community. As a preparation for the trials, a "Trial and assessment plan" was elaborated. The plan includes information regarding testing scenarios, methods, metrics, selection of users, and timing of the trials. The plan further includes a summary of the set up of the PICOS Angling Community Prototype field trials & lab tests. The trials were conducted between November 2009 and May 2010 with two groups of anglers in Vienna and Kiel. The output of the lab and field tests is presented in Deliverable D7.2a. The 2nd version of the report contains the results of the field trials (D7.2b).The report of D7.2 contains quantitative and qualitative data analysing usability in general and focussed on PICOS privacy enhanced technology. Therefore this deliverable provides important information for improvements of the second phase of the prototype development. All in all 24 users have been observed and interviewed to gather the results. The results are directing the improvements which have to be developed before bringing the prototype into a real-world context during the user trials. Moreover, the goal was to build a solid basis for the evaluation. took place. Results were also compared to the results of the first community prototype trials. The objective of the Evaluation phase (Deliverable 8.1) is to provide a legal, economic and technical evaluation of the work performed during the first cycle of PICOS. More specifically the aim of PICOS D8.1 is to conduct a multi-disciplinary evaluation of the PICOS Platform Design and Architecture v1, the PICOS Platform Prototype v1 and the PICOS Angling Community Application Prototype v1, focusing on trust and privacy elements, as implemented via the PICOS project, and more specifically on the determination of trust and privacy needs in the context-rich mobile communication services. The outcome of this evaluation is on the one hand the assessment from a legal, technical, economic and usability (where applicable) point of view of the privacy and trust aspects of the PICOS project and on the other hand the drafting of recommendations that are taken into account for the design and the development of the PICOS platform and application prototypes during the second cycle. The work of this present deliverable is complemented by the work conducted in WP3 “Assurance of Technical Trust and Privacy Properties”. The outcome of the assurance evaluation is included in three respective deliverables, i.e. D3.1.1 “Trust and Privacy Assurance for the Platform Design”, D3.2.1 “Trust and Privacy Assurance Evaluation of the Platform Prototype” and D3.3.1 “Trust and Privacy Assurance of the Community Prototype”. Given that the aforementioned WP3 deliverables are currently confidential, a summary of the main findings of the assurance evaluation are presented in the D8.1 Deliverable. Afterwards we followoed a similar approach in the second PICOS cycle. 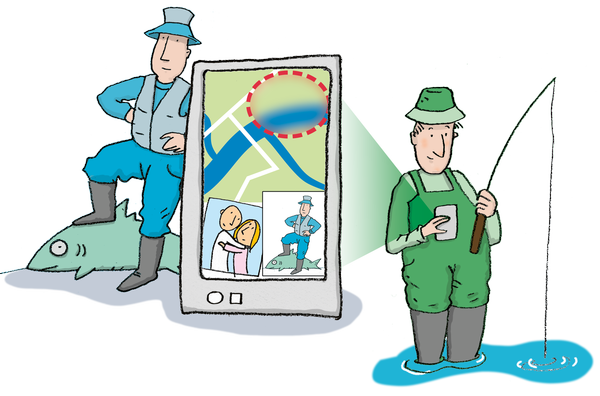 The maturing of the prototype implementation of the PICOS platform and the deployment for the second version of the Angling Community Prototype were evaluated, taking into account recommendations drafted under D8.1. Additionally, the PICOS Platform Design and Architecture v2, the PICOS Platform Prototype v2 and the PICOS Gaming Community Application Prototype are evaluated from a legal, economic, technical and usability point of view. As a final step,the we included experiences acquired from conducting the multi-disciplinary evaluation of the PICOS products and results, as documented in D8.1 and D8.2, in the thrid Evaluation Deliverable (D8.3). It also presents general recommendations for the future implementations of privacy- and trust-enhancing identity management systems on a European scale. This deliverable further summarises the feedback and results of a comprehensive questionnaire which was compiled for the recreational anglers as the first PICOS leisure time community. This exercise has been an important step to substantiate findings and assumptions related to gathering community requirements with respect to the PICOS concepts.